The ASCE Board of Direction met in Arlington, Virginia, March 21-22 and discussed several key Society initiatives important to the future of civil engineering. Among the significant items on the Board’s agenda were strategic dialogues with the Raise the Bar Committee, the Committee on Sustainability, and the Committee on Advancing the Profession. Also of paramount interest was a report from the Industry Leaders Council regarding a goal to reduce the life-cycle cost of infrastructure by 50% by 2025, and consideration of a motion to authorize the Los Angeles Section to create a parallel 501(c) (6) organization to engage in legislative, regulatory, and political activities. The meeting began with James J. O’Brien, Jr., P.E., M.ASCE, ASCE’s managing director of the Professional and Educational Activities Division, engaging the Board members in a strategy session to begin the process of defining the future direction of both ASCE and the civil engineering profession. After breaking into smaller working groups to brainstorm, O’Brien explained to the Board that the results of their thoughtful conversation and input will be part of a future Board strategy session, the goal of which is to incorporate strategic thinking, planning, and execution into Board activities and possibly lead the Society toward redefining its core strategies. 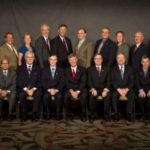 After careful evaluation of the costs, benefits, and implications for ASCE and the profession, the Board of Direction defeated a motion to authorize the Los Angeles Section to create a parallel 501(c)(6) organization to engage in legislative, regulatory, and political activities. ASCE is presently a 501(c)(3) nonprofit organization. The Los Angeles Section Board passed a motion on June 6, 2013, to allow the Section to engage in unlimited lobbying, to participate in a more meaningful way in public discussions that involve infrastructure and sustainability, and to form a Political Action Committee, or PAC. An informal webinar was held for the Board on February 20 to provide a full background of the Section’s request. After much discussion the Board voted the motion down. The Board heard from D. Michael Mucha, P.E., M.ASCE, chair of the Committee on Sustainability (COS), who kicked off a strategic discussion with a high-level overview of the committee’s charge, accomplishments, and ongoing activities. He notified the Board that due to the growing need for civil engineers’ involvement in human infrastructure, COS was planning the launch of a Human Infrastructure Subcommittee. Continuing on that theme, he presented the following 2 key questions for the Board to consider and discuss: On a scale of 1-10, how receptive is the Board to the idea that civil engineers can expand their value proposition to be more than builders? And, is now the time for ASCE to once again demonstrate our leadership with ISI to assure its success? The Board was very receptive to the idea that civil engineers should be more than just builders. The Board asked for more information to decide on whether to make more investment in the Institute for Sustainable Infrastructure, and the Board expressed strong support for the development of a sustainable infrastructure standard. The Board received a report from Anthony S. Bartolomeo, P.E., F.ASCE, chair of the Industry Leaders Council (ILC), regarding a goal to reduce the life-cycle cost of infrastructure by 50% by 2025 and optimize infrastructure investments for society. The ILC was charged by the Board to develop and apply life-cycle, performance-based standards of practice that facilitate resiliency and foster innovation, and to incorporate resilience as a fundamental principle embodied in all ASCE codes and standards. Specific recommendations will be presented at the next Board of Direction meeting, in July. The Board also spent time engaged in a strategic discussion with the Raise the Bar Committee (RTBC), which is charged with working to enact increased educational requirements for future licensure as a professional engineer. RTBC Chair Blaine D. Leonard, P.E., D.GE., Pres.10.ASCE, highlighted activities in ASCE member outreach, various state initiatives, Licensure Policy Committee activities with the National Council of Examiners for Engineering and Surveying (NCEES), additional training for Raise the Bar advocates, and a report under development by a task committee that will outline example scenarios on achieving the equivalent 30 credits in lieu of a master’s degree under the Raise the Bar framework. The RTBC and the Board strategized on future approaches and actions. The Board also requested that the Committee on Advancing the Profession continue conversation whether a policy on early taking of the P.E. exam is advised and whether ASCE should recommend changes to the P.E. exam to evaluate the practice component. Among the other items on the Board’s agenda was the acceptance of the Society’s Audited Financial Statements for Fiscal Year 2013, appointment of Tate & Tryon as the Society’s auditor for the consolidated financial statements for Fiscal Year 2014, receipt of a written report from the Student Transition Task Committee which included recommended actions that will be submitted for review as part of the FY15 PAES budget by the Member Communities Committee, and a report from Executive Director Patrick J. Natale, P.E., CAE, F.ASCE, on the activities of the Society since the October 2013 Board meeting. Finally, the Board approved amendments to the Rules for ASCE Standards Committees, and amendments to the Society’s Bylaws and Rules of Policy and Procedure to require Strategic Initiative Committees to engage in an annual discussion with the Board of Direction and allow submission of nominees for Distinguished Member and At-Large Director consideration.